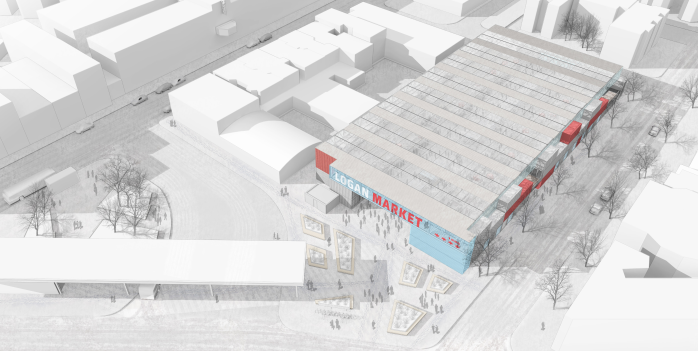 Could Logan Blue Line Parking Lot Become A Year-Round Market? 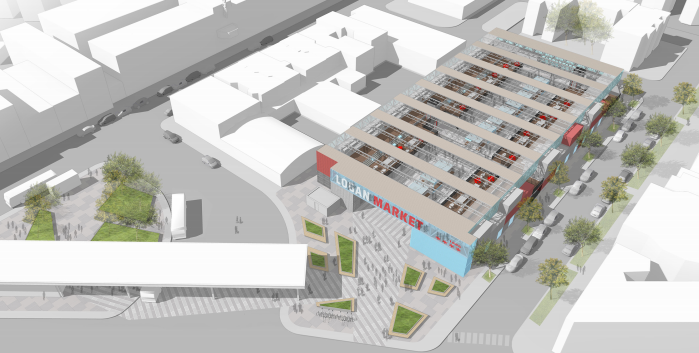 Local architect Josh Hutchison is proposing a year-round market for the city-owned parking lot next to the Logan Square Blue Line station. 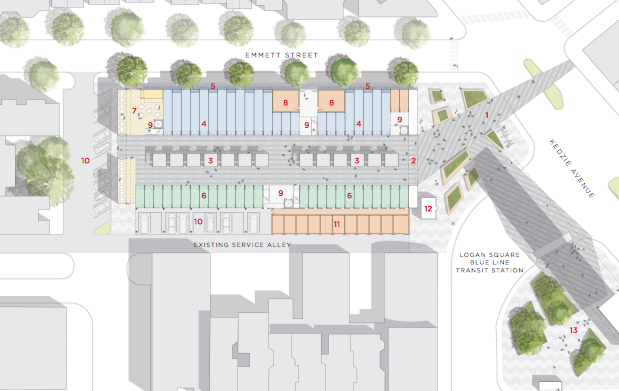 LOGAN SQUARE — Plans to redevelop the Emmett Street parking lot next to the Logan Square Blue Line station are gaining momentum — but not everyone agrees on what to build there. Some residents and community leaders, including the United Neighbors of the 35th Ward, which Ald. Carlos Ramirez-Rosa (35th) helped create, say the site should be redeveloped into an affordable housing complex to "keep the community economically diverse." Other neighbors, like architect Josh Hutchison, say the city-owned site should be redeveloped into a public amenity — not housing for a select group of people. "This is an incredible piece of public land and my attitude is firm that it needs to hold a public amenity," Hutchison said. "In my mind, a public amenity is something that is open to the public. I can't walk into someone's apartment and enjoy a Sunday afternoon with my family." Founder of Avondale-based 34-Ten Architecture, Hutchison has been at work crafting a proposal for the site since June. 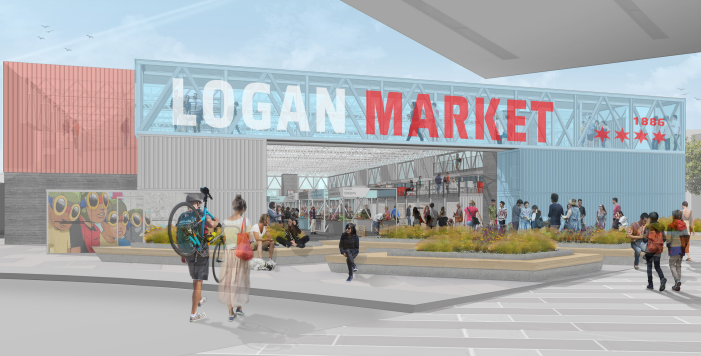 What he came up with is a year-round market with a retractable roof that would double as a small business incubator and serve as a permanent home for the Logan Square farmers market. He said the alderman's office will review the proposal next week. "We're addressing gentrification in the neighborhood" with the proposal, he said. "What I'm envisioning is pop-up businesses, people who can't quite raise the funds. 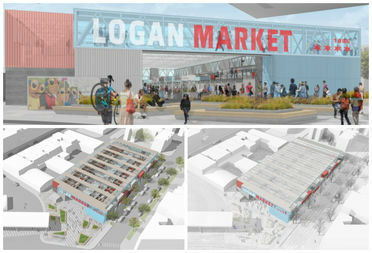 Here at the Logan market they'll have an opportunity to sell. " Hutchison, who has lived across the street from the site since 2012, emphasized he's not against affordable housing. He said any kind of housing — whether it's luxury or affordable — is wrong for the site. "It has nothing to do with affordable housing. My concern is that this is going to be turned into some sort of class warfare issue and that's not the case," he said. Meanwhile, members of the United Neighbors of the 35th Ward are actively pushing for an affordable housing complex. For at least a month, the group has been knocking on doors to drum up support for the project which it says represents the desires of the community. Ramirez-Rosa supports an affordable housing complex because it's what an "overwhelming" number of residents said they wanted during a series of community meetings and surveys in 2014. More than 500 people filled out surveys as part of the community process, which was led by then-Ald. Rey Colon and the Metropolitan Planning Council. Since taking office in February 2015, Ramirez-Rosa said he's been approached by several developers interested in the site. So far, none of the proposals has fully met the community's criteria, which he said is the basis for his support. When asked to respond to neighbors like Hutchison who want to see a public amenity, Ramirez-Rosa spoke in favor of affordable housing. "I believe affordable housing is a public use," he said in an interview earlier this week. "I believe that long-term working class residents of Logan Square have a right to remain in the community. The only way we're going to accomplish that is with affordable housing. I've been unequivocal in that." It's unclear if the alderman supports Hutchison's proposal. His office didn't immediately respond to a request for comment Thursday afternoon. For Hutchison, pitching a year-round market is just the first step in a long approval process. Should it win approval from the alderman and the community, the project would then need to be funded. He said it's too premature to predict how much the project would cost. "We don't know where this is going to go," Hutchison said. "But I would be excited to see some version of this occur on the site."